The stunning landscape of Northern Ireland provides the backdrop for the HBO award winning TV series Game of Thrones, with extensive filming along the Causeway Coast and Glens. 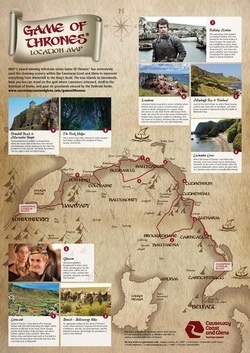 Staying at Shola Coach House Boutique B&B in Portrush you can step into the real world of Westeros and easily explore the Game of Thrones filming locations where so many of the pivotal scenes were shot - click on the links below to download the suggested self-drive itineraries. Click on the image for more information or on the link below to download the map.